Mineral dust is an important player in the climate system, but its spatio-temporal variability is not fully understood. 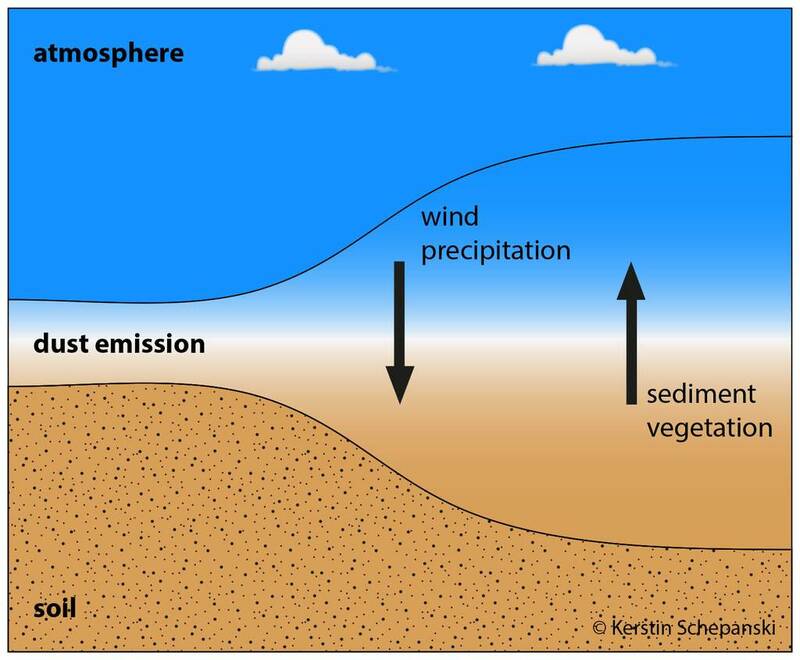 The emission of dust particles as first element of the atmospheric dust life-cycle can be seen as a process allocated at the interface of atmosphere and soil surface. For dust emission, sediments suitable for wind erosion has to be available. At the same time, wind speeds at near-surface levels have to be sufficiently strong to mobilize and entrain dust particles into the atmospheric boundary layer. However, there are places, where dust emission is limited due to the supply of sediment prone to wind erosion, and places, where dust uplift is limited by wind speeds. 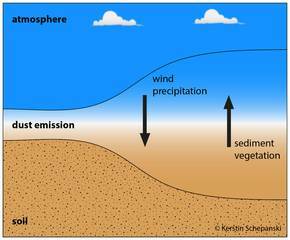 Dust sources and dust emission are the beginning of the atmospheric dust life-cycle. As origin of dust particles entrained into the atmosphere, the knowledge on when-is-where-how-much-dust emitted is crucial for determining the transport pathways of dust into remote areas such as overseas to Europe or the Americas. Also, estimates on dust impacts on the atmospheric radiation budget and nutrient cycles rely on an accurate knowledge on the atmospheric dust concentration and its spatio-temporal variability. The dust source per se: Which soil characteristics are apparent and are there changes over time? Processes fostering dust emission and the development of dust storms: Which meteorological conditions (weather) provide wind speeds sufficient high to uplift dust particles and to distribute them within the atmosphere? In the frame of the project Dust at the interface - modelling and remote sensing (short: InterDust) we investigate the spatio-temporal variability of desert dust. Main focus of the project is the investigation of processes at the interface atmosphere - soil surface which result into dust emission. Therefore, we use techniques from numerical modelling and satellite remote sensing. The project is funded by the Leibniz Association for the 3-year period 2015-2017. How well does the satellite identify dust? This work package examines the information content as well as the uncertainty and sensitivity of the MSG SEVIRI IR dust product with regard to different atmospheric conditions and dust optical properties. The investigation of the impact of human activity on dust emission is the main focus of this work package. In particular, the role of anthropogenic land use and bush fires to dust emission will be investigated. Alluvial sediments in desert valleys and alluvial fans are known and frequent dust sources over North Africa. They show an interannual variability with regard to their erodibility and thus emission efficiency. Interannual changes in local dust emission fluxes are apparent. Following a characterization of these temporal changes, the representation of alluvial dust sources in numerical dust production models will be improved. An holistic and summarizing analysis of the contribution of anthropogenically influenced and alluvial dust sources, two dominant dust source types over North Africa, will be performed.